Integrated pest management is an environmentally friendly method of eradicating and managing pests. Pests may include insects such as termites, ants, cockroaches, spiders, mosquitoes, fleas and bedbugs. Pests may also include rats, mice, squirrels and other rodents that become a nuisance to households and commercial establishments. Pests may also affect crop production or gardens. IPM uses techniques that remove the breeding places of pests, disrupt the breeding cycle and control re-infestation. Pesticides are used only when needed, and only the safest pesticides are used to get the job done. The result is a safer environment for you and your loved ones while eradicating unwanted critters from your property. If you think you have pests in your northern California home or business, the first step is to identify the exact pest. Treatment plans are tailored to the specific pest. A licensed pest removal professional such as Sorenson Pest Control should be called to identify the pest causing the problem. The technicians will conduct a thorough examination of both the interior and exterior of your home or business. Technicians will look for places that pests can enter the building such as cracks in the foundation or holes around electrical outlets or plumbing. If you have pets, bedding and feeding areas will also be examined. Many pests are attracted to moisture. The technician will look for leaks under sinks or behind tiles that provide moisture that pests need to thrive. Technicians may use special tools to detect moisture behind walls or in other areas that are difficult to see. Technicians will also look for signs of wood-boring insects. Piles of wood dust or clusters of insect wings near wooden doors and windows may indicate a carpenter ant or termite infestation. The exterior will also be examined. Technicians will identify all areas that are possible breeding or nesting grounds outside. Mosquitoes need only a few centimeters of water to breed and live. Unused flower pots, old tires and other sources of water will be identified. Woodpiles are also a common nesting ground for termites, ants and rodents. Each area will be listed to help you understand what is attractive to pests and what should be eliminated from the landscape to control pest infestation. After the inspection, technicians will recommend ways to eliminate and control pests. First, they will discuss ways to eliminate breeding grounds and prevent re-infestation. They will also discuss treatment options such as traps, baits and topical applications. • Seal cracks in foundations or walls. • Keep food preparation areas clean. • Empty food waste daily; place trash in covered, tamper-proof receptacles. • Keep eating areas clean. • Store food in sealed containers. • In offices, ask employees to eat in designated areas, not at their desks. • Remove sources of standing water. Treatment will be specific to the pests identified and tailored according to your unique situation. IPM relies on control and management. Baits and traps may be used for rodents or cockroaches. The least toxic pesticides that eliminate pests will be used as needed. Your safety is our concern. 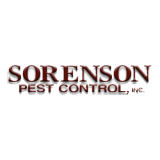 For more information about using IPM for your pest problem, call Sorenson Pest Control for a free estimate!